Alternative treatments, antibiotics and remedies that enhance antibiotics are all valid options that can work in a synergistic way to increase you treatment success. Most natural remedies and home treatments lack the strength to stop stubborn, life-threatening or chronic superbug infections. Effective remedies for Staph and MRSA require the right potency and quality, as described below. These natural therapies can enhance and complement mainstream antibiotic treatments, or they can be used as alternatives against all types of infections. It’s important to know the pros and cons of all the treatment methods available to you. 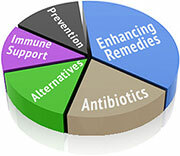 Antibiotics may be needed and can be life-saving. However, because of their limitations and side effects, there are advantages to using antibiotics along with enhancing remedies. Using alternatives to replace antibiotics is another option, especially if these drugs have stopped working. The more you know your treatment options, the more empowered you become to control your infection. Click here to see the pros and cons of conventional vs. alternative/complementary treatments. Manuka Honey – This honey is a special medicinal honey that is one of the best natural remedies for Staph and MRSA and has been used for treating infections for over 200 years. Your average supermarket honey will not have the same health benefits as Manuka honey. Some people consider this medicinal honey to be much more potent than antibiotics for healing infected wounds. This therapeutic honey has become a popular, affordable and easy to use MRSA natural treatment. Not all Manuka products are created equal, and certain types have been shown to have the best anti-bacterial qualities. After reading Chapter 6 of MRSA Secrets Revealed, you’ll understand which Manuka Honeys are the best, how others have successfully used it for MRSA, and where to find this amazing honey. Precautions: Some people may have a food allergy to honey or may be sensitive to bee products. Diabetics must take into account that honey is over 30% glucose if using it internally. Essential Oils – These powerful anti-infection agents are literally the immune system of the plant. The oils are extracted from specific plants into a concentrated form, many of which have potent antimicrobial, antifungal or antiviral properties. Unlike antibiotics, which are often a single chemical component, essential oils are made up of hundreds or thousands of chemical compounds working together, which makes them very difficult for bacteria to become resistant to. These oils are therefore one of the most potent natural remedies for MRSA available, and are Michelle’s personal favorite for many different uses. Essential oils vary widely in quality, composition and intended use with many different brands and types to choose from. It is important to use only the highest quality therapeutic grade products. Because they are very concentrated and potent, they should only be used following the proper precautions and protocols. Click here to find out more about essential oils for infection. Precautions: As mentioned above, only certain plant oils are effective against Staph or MRSA. And the essential oil market is one of the most confusing and difficult to navigate that I’ve ever encountered. For instance, 95% of the oils on the market are only for aromatherapy or perfume purposes and absolutely should not be used for therapeutic purposes. Oils are typically not pure (even though the label says so), and many oils are tainted with chemicals or solvents used in the extraction process which can damage your body. Only the highest quality, certified and therapeutic oils should be considered for use. Garlic and Other Herbs – Many herbs, especially garlic, have a long history of use in combating infections. Garlic was used extensively for fighting infections as a natural remedy before the invention of antibiotics and garlic also supports immune system health. Garlic contains “allicin”, a potent broad-spectrum natural antimicrobial substance that is very sensitive and degrades easily. Garlic oil, aged garlic (like Kyolic) and most powders have no active allicin. Garlic must be processed specially to retain its antimicrobial activity. Properly prepared antimicrobial garlic products in powder and liquid form have been clinically proven to kill MRSA in controlled studies. Click here for much more about garlic for infections. Precautions: Garlic must be used with care for people taking anticoagulants because excess garlic can hinder blood clotting. Some people have a food allergy to garlic. Colloidal Silver – Colloidal silver is microscopic particles of silver that are held in a liquid suspension. Prior to the invention of antibiotic drugs, silver was also widely used by physicians as a mainstream antibiotic because of its germicidal properties. Colloidal silver is usually available as liquids and creams. Colloidal silver products have varying degrees of germicidal activity and not all silver products are created equal. Factors including silver production and silver ion size contribute to the effectiveness or lack of in the product. Precautions: A very rare medical condition called Argyria which causes irreversible gray skin coloration can occur if large quantities of improperly prepared silver accumulates in the body. You may have seen the real “blue man” on Oprah recently. However, despite the fact that silver is a heavy metal, there have been very few reports of toxicity, especially if the product used as indicated. An area of dead bacteria (see arrow in image) destroyed by a phage solution specifically tailored to kill this species of bacteria. Viral Phage Therapy – Bacteriophage or “phage” are viruses that actually target and invade bacterial cells and can cause the bacterium to “self-destruct” or explode. Unlike viruses’ that cause a cold or flu by infecting cells of the human body, these viruses only attack bacterial cells, not human cells. Phage therapy is the therapeutic use of these bacteriophage to treat pathogenic bacterial infections like MRSA. The side effects are less than seen with antibiotics and phages don’t seem to create any resistance issues in bacteria. Precautions: This technology has been in use in the Republic of Georgia and in European countries for many years, and is starting to enter the US and Canada. It has had a very good success rate. Although these phage have been modified to target MRSA or other strains of pathogenic bacteria, Michelle has some concerns about long-term health and if these phages can or will eventually target “friendly” bacteria in the body. Alternative Health Care Professionals – First, I believe it’s important to work closely with a health care professional such as a Naturopathic Doctor (ND), a MD who is also a ND or other qualified Natural or Holistic health care professional. Having a professional to guide you is very important to your overall success with your MRSA or Staph infection. If you are working with a Medical Doctor or Infectious Disease Doctor (ID), look to integrate your treatment approach with a holistic practitioner. 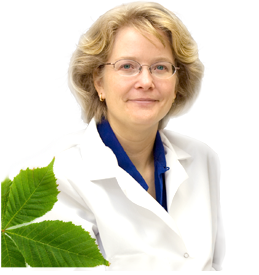 Naturopathic Doctors (ND) are specifically trained in the use of Alternative medicine and can be a valuable resource to those who wish to use alternative MRSA infection treatments. Naturopathic medicine focuses on finding the cause of illness and then stimulating the body’s ability to heal itself – thus resolving the illness and addressing the underlying cause. Boosting the Immune System – Boosting the immune system is a critical component for many when it comes to overcoming MRSA and Staph infections. This is an often overlooked element to preventing the widespread problem of recurring infections. You can find out more about your immune system and how to support it in the Prevention section of this website. Precautions: When it comes to boosting the immune system, there are no specific precautions, however, be sure to consult with your physician before starting any supplements. Energetic Medicine – Energetic medicine comes in two different forms – one that can be physically or scientifically measured (like sound or vibrational therapy), and one that is not measurable using linear methods (such as prayer). Energetic medicine is often used to reduce pain, stress and suffering. Some methods can be used for positive treatment and diagnostic purposes as well. Just because something is “natural” does NOT automatically make it “safe” or “effective”. It’s important to understand what makes a product safe and effective and how to avoid others. It’s also important to use remedies properly to see the best results for your infection. Michelle recommends working with a holistic, integrative or natural medical professional. She also recommends doing your research and arming yourself with trusted and reviewed information. Take the guesswork out of MRSA and Staph recovery. Michelle has researched all the options out there, what works and what doesn’t, so you don’t have to. There is certainly information online that is not credible and could be damaging to your health. Wouldn’t you rather spend your precious time getting well instead of researching? MRSA and Staph are serious and potentially life-threatening infections. Antibiotics and conventional medicine often fail against these superbugs. Fortunately, there are powerful complementary and alternative remedies for handling these infections. 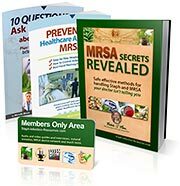 The MRSA Secrets Revealed Program contains Michelle’s 3-Step Infection-Free Method™, a complete how-to guide to stop these infections. The program includes the strongest remedies for skin, internal, nose and other types of infection. Detailed protocols are provided for using these remedies either as alternatives to, or along with your doctor’s treatments. The program also shows improved ways to protect yourself and your family at home, in hospitals and in the community.